This TeaArt tea set is designed by artist and designer, Lam Wong, and manufactured with white ceramic ware in the Fujian province, China. It is a custom made, limited edition item with only 100 sets. 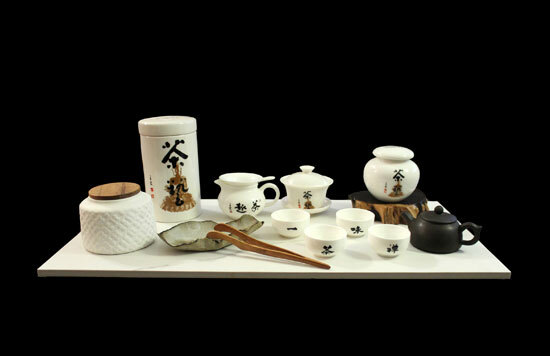 The tea set includes a large tea container, a tea jar, a pitcher, a strainer, a hand strainer holder, a set of GaiWan (tea brewing cup) and 4 tea cups (labeled with characters: Tea, Zen, One, Flavour). The Chinese Calligraphy is taken from the master calligrapher/tea master, Don Wong.